Patron's Hacienda is known for its authentic Mexican food, cocktails and hosting events and parties. The main area of the restaurant has a pub like décor with booth style seating and single square tables, and dim lighting all over. The ambiance is casual and happening with DJ playing music during the nighttime and there is enough space for dancing, as well. It is popular among sports fans who come to Patron's Hacienda with their friends to enjoy their favorite games on its fourteen 55"LCDs spread across the premises. Aside from the main room, there is Salón Oeste and Salón de Arriba reserved for parties and events. The menu highlights at Patron's Hacienda are antojitos, sopas, entrées, la taqueria, signature gourmet tacos, acompañamientos and postres. There is a separate menu for drinks featuring the restaurant's specialty beers, cocktails and mocktails. It takes reservations and offers takeouts, as well. 1/2lb. burger with Bacon , Mushrooms, Sautéed onions, Mayo, diced pickle & Cheese. Served with Fries. 3 classic enchiladas stuffed with cheese, and topped with melted cheese, cilantro, green onions & sour cream plus your choice of red, green or mole salsa. Served with rice and beans. Substitute chicken or ground beef for $2; Substitute steak for $3. 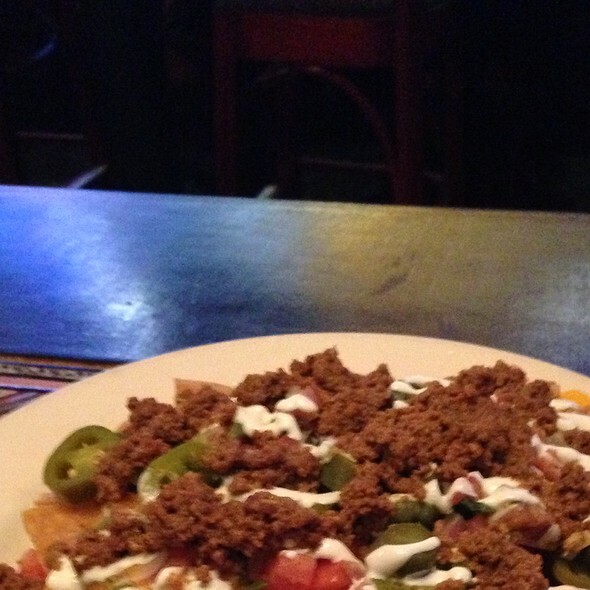 Our tortilla chips, smothered with melted cheeses and topped with sour cream, pico de gallo, guacamole & jalapeños. Melted chihuaha cheese stuffed in flour tortillas, with side of guacamole and sour cream. 2 steam-cooked corn meal dough stuffed with chicken or pork and topped with your choice of green or red sauce, and sour cream. Served with rice and beans. 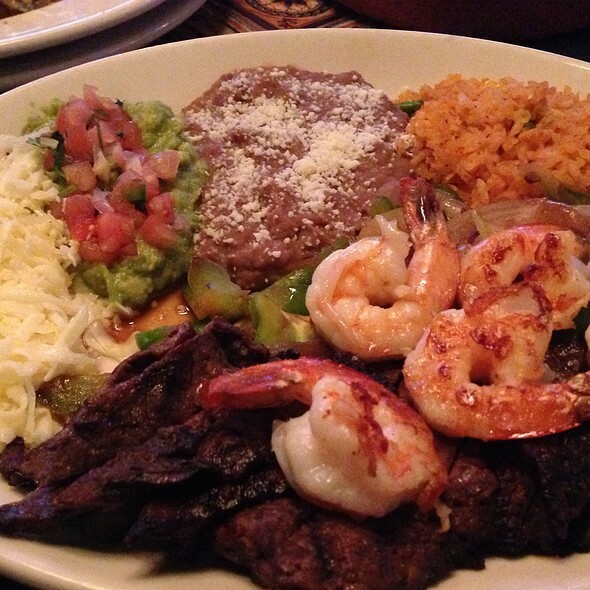 Grilled skirt steak topped with sliced chile poblano, served with a cheese Enchilada, rice, beans and guacamole. A traditional Mexican dish, eaten during brunch. Corn tortilla fried until golden then sauteed with green salsa. Served with 2 eggs, sunnyside up on a mini tortilla. Three eggs, tomatoes, onions & jalapeno chilli peper scrambled up. Served with refried beans & rice or house potatoes. Mini-tortillas topped with an egg & tomatillo sauce. Served with refried beans & rice. 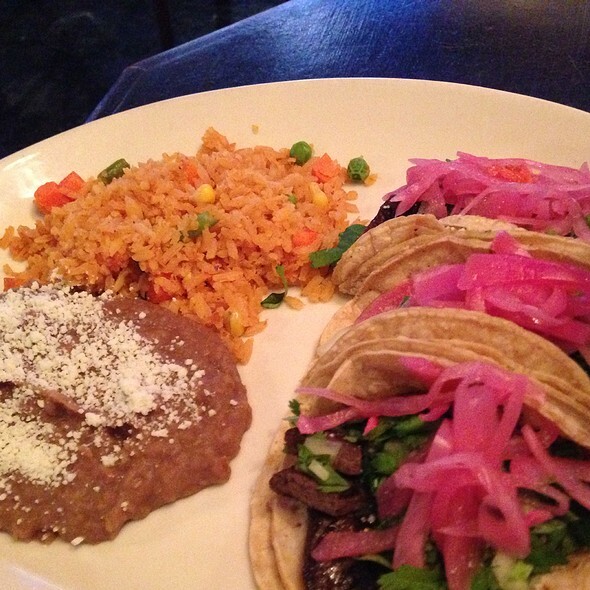 Select your main course ingredients for the following entrees With your choice of: Steak - Chopped, marinated skirt steak. Chicken - Marinated and grilled chicken breast. Chorizo - Fresh Mexican sausage made in house. 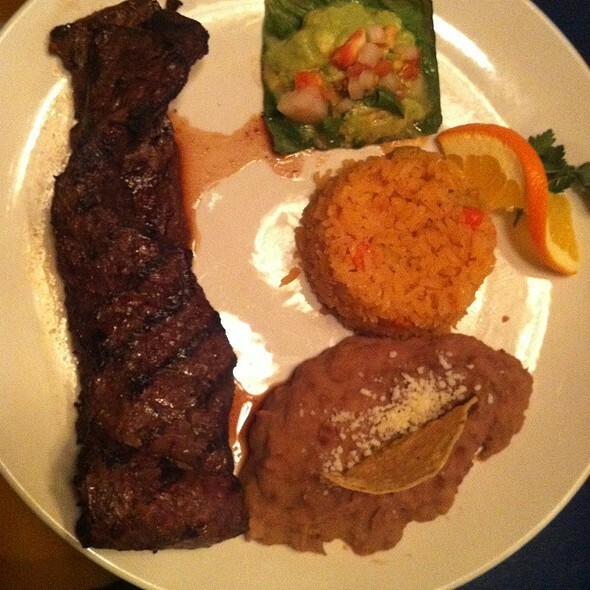 Chori-Louie - A perfect blend of fresh chorizo and grilled marinated steak - Add $1. Vegetarian - Sauteed squash, zucchini, carrot, mushroom, and onion. Carnitas - Braised Port. Pescado - Sauteed tilapia seasoned with Mexican spices. Shrimp - Grilled shrimp seasoned Mexican spices - Add $4. All dishes served with rice and beans. Flour tortilla, filled with rice, beans, cheese, sour cream and your choice of meat. Your choice of two corn tortillas, flour tortillas, or hard shell tortillas, filled with your choice of meat, topped with lettuce, tomato, and cheese or onions and cilantro. 2 Fried tortillas topped with your choice of meat, lettuce, tomato, shredded cheese & sour cream. Gorditas are Mexican corn cakes made with masa (cornmeal), which is patted into circles of 2 - 3 inches then cooked on a comal and deep fried. Filled with beans & cheese in the pocket. Same as our burrito, but deep fried, and topped with tomato, pepper salsa and sour cream. So called because they're shaped like sandals, huaraches are like a pizza made of masa (cornmeal), piled with your choice of meat, beans, green sauce & sour cream and griddled until crisp around the edges. Mexican sandwich with beans, mayo, tomato, chipotle, cheese, lettuce and your choice of meat. 2 Sopes are little bowls of a corn-based dough that are baked on a griddle, topped with beans, then filled with your choice of meat, and topped with lettuce, tomato, cheese and sour cream. Steam-cooked corn meal dough stuffed with chicken or pork and topped with sour cream. Your choice of red or green sauce. Salad Dressings: Ranch, Chipotle Ranch, Caesar, Chipotle Caesar, or Vinaigrette with bacon bits. Strips of grilled skirt steak on a bed of the garden's best greens, topped with red onions, queso fresco crumbles, tomatoes and crispy tortilla strips. Second time there. Enjoyed it more the first time. Service was very good. But the food arrived cool. Very attentive service with great happy hour specials on appetizers and drinks. Enjoyed some sangria with delicious guacamole. My friend enjoyed the chicken mole. My steak quesadillas were tasty but a bit greasy. Overall, we really enjoyed the food with the server's friendliness and efficiency. We reserved a table for 7 on Cinco De Mayo. Can be tricky on a big holiday like that but we where seated early, not fuss about the whole group not being there right at 7 which is always nice!! The food and drinks as always where great, we had some issues with our order being right though not sure if it was the added noise because of the holiday or that server but it was annoying enough I took off a star. They had a 9 piece Mariachi band in for the occasion which was a really nice addition to the night! The large red lamp shades make the bar side of the place more interesting. Decent Mexican food including a couple of nicely cooked skirt steak offers - the carne asada was quite flavorful and surprisingly tender. The carnitas tacos were tasty. The queso fundido w chorizo was good - but the proportion of chorizo to cheese was off - needed more than a sprinkling of chorizo. Did NOT appreciate the waiter bringing two "cadillac" margaritas at $12 each when I ordered the House traditional margarita. To make the matter worse, the cadillac tasted no better than the traditional and just somewhat bigger in goblets as oppose to a glass at a significant mark up. Crazy busy on Cinco de Mayo. Should have paid more attention to what was served. Very spacious. Separate bar and dining areas. Very happy having gone in not knowing what to expect. Not fancy, but good, chilled atmosphere with tasty drinks. I found this place online just by searching mexican. Im pretty sure the location was the old coyote ugly, not that familiar with the city, lol. Great food, great service, plenty of top tequila, in short I cant complain. Nice place, very colorful. Waitress was very nice,energetic and attentative. The food was good, however if you can't handle spicy food then please let your waitress know. The food was good no complaints on that end. Our family had another very pleasant meal at Patron's this weekend. Special shout-out to our server, Pricilla, and to our favorite hostess Gloria. They made us feel very welcome and at home. Food was lukewarm. Had to walk to the back of the restaurant to ask for service. Lightbulbs needed to be replaced. Just really a bummer. Won't be back. Way fab.......delicious food, attentive service....we will be going back....wonderful experience. We had a girls dinner here after one had returned from a trip, so it was nice that it wasn't crowded/loud since we were planning on hearing all about the trip. Our server was good, however we all said the food was just 'ehh'. I had the enchiladas with "red" sauce. It is like no red sauce I had ever had. It was very dark and thick. I asked if I was served mole on accident. She said, 'no, this is just how our red sauce is.' Ok, note to self. My friend got the chicken fajitas and said they were just pretty bland. Other friend got the steak tacos and said they were fine. We all agreed our drinks were good (Margaritas, Micheladas and Palomas). We left saying that we would rather have traveled further for Uncle Julio's. Is the best time I've ever had my wife took me there one time for my birthday and this time I had friends and the whole family and it was a very exquisite time. The drinks were phenomenal. First time here and it was a nice spot to grab some Mexican food and a few beers. Great place for friends to gather. We went to eat dinner for Valentine's Day as a last minute plan. I was delightfully surprised that the food was good and the ambiance was nicer than I thought it would be. My family eats at Patrons about once a month - - we consistently have an enjoyable meal, delicious food, reasonable prices, and great service. A special shout-out to our usual server, Gloria, who is exceptionally attentive and friendly. The food was good but the atmosphere was just okay. Everything was fairly priced. I would probably eat there again. We were the only table in the restaurant, and the waiter could not seperate our bills for us. It took him a whole hour to figure it out. He was confused about who had what. I had to assist him and do his job by coming back to my table to ask for him. In the meantime of him trying to figure out the bills, he went to take other orders. Aside from that, I clearly stated in my reservation notes that it was my bday, and did not get a Happy Birthday dessert or acknowledement. Worst experience ever. They pre-charged us 20 percent gratuity for the horrible service! I suggest not wasting your time at this establishment! I have been to Patron's twice. Both times, the food was exceptional. The skirt steak is amazing and I love their chile rellenos. The margaritas were good as well. The first time we went, it was a weeknight and they had a DJ playing music. It was loud but lots of fun. The second time was a Saturday night and they had the football playoffs on the TV's - it changed the ambiance from a mexican restaurant to a sports bar atmosphere - not what I was expecting for "date night." We go with our family for dinner to Patron's about once a month. 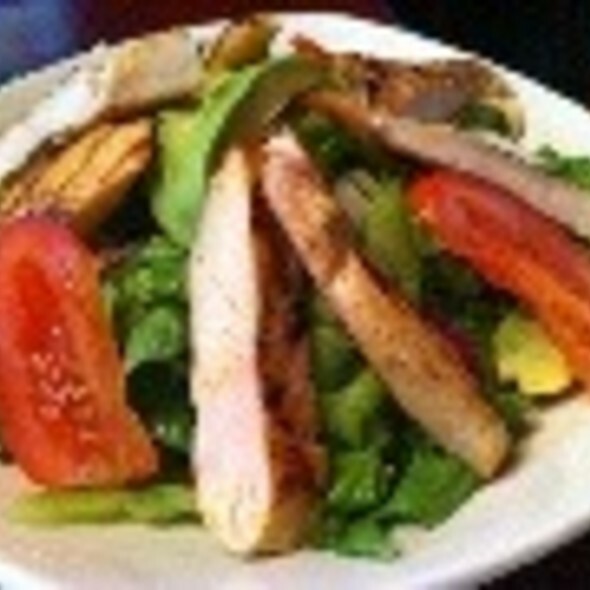 The food is consistently excellent, and our regular server Gloria is outstanding. Went to Patron Hacienda to meet friends for a birthday gathering. The location, decor and food are good. Drinks were wonderful. Wait staff was pleasant but service was a little slow. It was a salsa Monday and the night of there Pre- New Years Eve Bash so this may have been an attributing factor. I would go back and give them another chance. The portions were large and the food delicous and authentic. The quesadilla appetizer would be enough as an entree for one. The tilapia and skirt steak were cooked perfectly. We had enough leftovers for another meal at home! Our server was very attentive - checking with us several times to make sure we had everything we needed. Good restaurant, Good drinks, excellent ambience, good service, just little bit overpriced on the food. The bartender is excellent however I didn't think the food was the greatest although I ordered Baja Tacos and maybe just wouldn't recommend them to anyone. Not to busy at 7:45 on Saturday. Elotes are awesome! I'd go back for a quick bite. This place is horrible , bad service , bad food , never coming back ... .. The location and the restaurant were great. We didn't wait much for our table. However, we waited a long time for our food even though there weren't that many people in the restaurant since it was still early before the dinner time rush. We enjoyed the Margaitas. Spectaular. The best part of the restaurant is that the wait staff is knowledgeable and friendly. 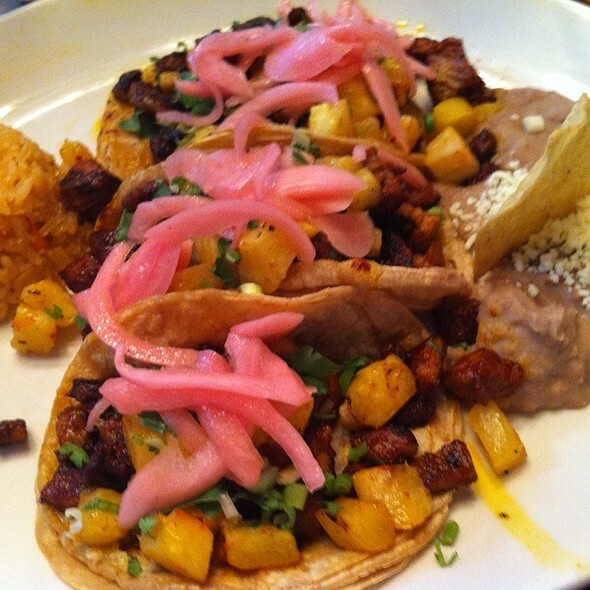 Our experience at Patron's was excellent: very good food, outstanding service, very reasonably priced. We particularly appreciated our server, Gloria C, who greated us warmly and remembered our preferences from our last visit over a month ago! I was very impressed with their tequila menu and enjoyed possibly the best margarita I have ever had. The don't use a mix so it is fresh and wonderful! I could have eaten a ton of their salsa and if I wasn't stuffed, I would have gotten some to go. The only thing I found a bit disappointing was the refried beans. My friend and I both felt they might be out of a can. Other then that, a good time was had by all EXCEPT for the fact the ceiling fans create gale force winds on your hot food. A party of 15 and not be able to get seperate checks is just ridiculous. Not everyone dranked that night so its not like we could have split it equally. I was very dissapointed! The waitress was very cold and not friendly whatsoever. Best margarita I ever had! The waiter was really helpful as well, giving us recommendations-which turned out to be great!! Would definately visit again when I'm back in town. We had noticed the place a few times and decided to check it out. It was easy to find a table on the small patio on Saturday night. The food was okay, but nothing special for Mexican food. In fact, it seemed a bit boring. 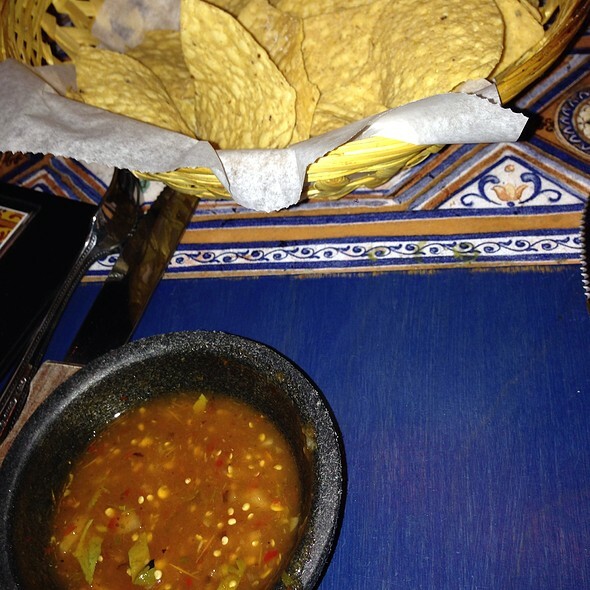 But we did ask for mild and not spicy suggestions, so it might have been our mistake. The sides of rice and beans were just bland and boring. My girlfriend really liked her Margarita and the drink menu looked much more interesting. The service was very good(don't recall the server's name) He was helpful with menu selections, very friendly and the bus staff were also very attentive. Might be a good place for locals to go since it is friendly and you can get something reliable, if not exciting. The staff was friendly and attentive, our server recommended her favorite dishes and they did not disappoint. The bartender that evening made sure to keep the drinks flowing and made sure everyone was having a good time. We will definitely be coming in again. The customer service is Excellent!!! We had a great experience. I cant wait to make it back for more dinner and dancing.